Alex Jacob is a United Reformed Church Minister, ordained in 1985. Since 2006, he has worked with The Church's Ministry Among Jewish People (CMJ). Alex has travelled and ministered widely in a teaching and leadership role and is also the author of two other books: The Case for Enlargement Theology and Receive the Truth! Both are published by Glory to Glory Publications. How does the birth and subsequent ministry of Jesus connect with the big picture of God's past promises and His future purposes? Alex Jacob explores this theme through the Church's traditional preparation for Christmas during its 'Advent' season when it reflects on four key 'players' in the build up to the Messiah's birth: The Patriarchs, the Prophets, John the Baptist and Mary, the mother of Jesus. Each of these connects with the wider story of God's purposes. 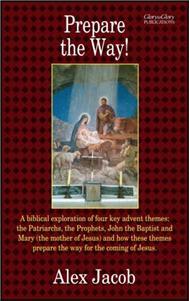 This is not just a 'Christmas' book! The themes explored cover 2000 years of God's dealings with people up to the Birth of Jesus in Bethlehem, and look forward to His return in glory. Written in an accessible yet authoritative style, this is a helpful resource, suitable for private and group study. It sheds fresh light on God's faithfulness and on issues of our own personal discipleship. Foreword by Rev David M. Moore. Church leaders, preachers, Bible teachers and students who are wanting to explore advent themes and how the Old Testament and New Testaments are linked together.